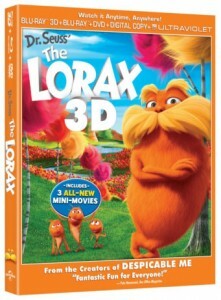 Universal Studios has announced the official release date for Dr. Seuss’ The Lorax on Blu-ray Disc, Blu-ray 3D, DVD, and Digital Download will be August 7, 2012. Both of the Blu-ray editions will contain Digital and UltraViolet copies of the films (provided on the DVD or via the cloud, respectively). The editions contain three new mini movies titled “Serenade,” “Wagon-Ho” and “Forces of Nature.” There is also a deleted scene, several featurettes, audio commentary, and Blu-ray bonus features such as uHEAR and pocket BLU. Video is formatted in widescreen 1.85:1 with English DTS-HD Master Audio 5.1. You can pre-order Dr. Seuss’ The Lorax from Amazon. ULTRAVIOLET™—The revolutionary new way for consumers to collect movies and TV shows, store them in the cloud, and download and stream instantly to computers, tablets and smartphones. Currently available in the United States only. DIGITAL COPY—Viewers can redeem a digital version of the full-length movie from a choice of retail partners to watch on an array of electronic and portable devices. pocket BLU™ APP—The popular free pocket BLU™ app for smartphones is now even better with newly updated versions for iPad®, Android™tablets, PC and Macintosh computers, with features made especially to take advantage of the devices’ larger screens and high resolution displays.